Georgetown Texas was formed on March 13, 1848. Georgetown is celebrated as The Red Poppy Capital of the Lone Star State which attracts folks from all over every year for the annual Red Poppy Festival. The population in Georgetown has more than doubled from 2000 to the present. Many Texans are moving here to retire and enjoy the amenities and hospitality offered in this great town. Maintaining your home is an important factor to enjoying your life in comfort. Many of the homes in this area have inadequate insulation in their attics. This puts a stress on the air conditioner, which accounts for 65-70% of the total electric bills in a given household. The technology advancements in insulation have come a long way. We used to think just dropping some fiberglass batt insulation in an attic was all you needed. Kind of a set it and forget it ideology. We have since found that this is not the case and that there is far more we can do to keep our home comfort systems much more efficient, while keeping the threat of high electric bills at bay. Technology has brought us better solutions that are much more efficient and are effectively green energy products. One of the first advancements was radiant barrier insulation foil. This product is applied to the underside of the roof up in an attic and fastened to the rafters in the roof system. The result is that this product will deflect 97% of the harmful heat rays from the unforgiving Texas Sun. This in turn, keeps your attic cooler and allows that fiberglass insulation to more efficiently do its job of maintaining the climate in your home. The other advantage is that your HVAC unit will not have to work as hard delivering cold or warm air to your home all season long. Radiant barrier insulation is a highly recommended inclusion to your existing attic insulation. The product we use is 5 mils thick (about like the thickness of a camping tarp) and it exceeds the government’s requirements by an emissivity of 0.03 (reflects 97% of infrared heat) ASTM E408. Radiant barrier is so effective that there are many city governments, Austin included, that have amended the city building code to mandate the installation of radiant barrier foil in all new homes being built today. Their research on the product proved that it is in fact effective and necessary to any Texas home. Homes with a radiant barrier installation enjoy a reduction in their utility bills with a monthly savings of up to 40%! That is a good thing! In the same instance, the temperature in the attic is reduced by up to 30 degrees. The average attic can get upwards of 160 degrees in an average Texas summer. Anyone for baking cookies? So if that temperature is lowered by 30 degrees, it can make a substantial difference. This brings us to our next topic of interest…your existing insulation. So you bought a home in Georgetown and are happily reaping the benefits of living in the area, enjoying the many outdoor activities and so forth. It’s when you get home, check the mail, and see that utility bill which makes you cringe. The cost of living is high enough as it is without being hammered by the electric company because you want to live in comfort. It could be a simple fix by upgrading your home’s attic insulation. If you climb up that hallway ladder into your attic and see the insulation is below the joists in your attic floor, Georgetown, you have a problem! 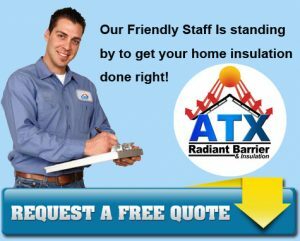 ATX Radiant Barrier & Insulation has your solution. Blown fiberglass insulation is a fantastic addition that can bring your current insulation back up to spec. It can be simply blown over your existing insulation and increase the R-value which will make an instant difference. Insulsafe Blown Fiber Glass Blowing Insulation is the product we use in residential and commercial construction as a thermal and acoustical insulation. It is designed for pneumatic installation in open attic areas and for retro fitting attic/ceiling construction assemblies. This product has proven to be a superior solution for all attic applications. It is made in the USA, and that makes us proud to offer it to you. In addition, this insulation is GREENGUARD Gold Certified for low chemical emissions into indoor air during product usage. Our professional team will come to your home and in a matter of hours you will be benefiting from knowing that your home is now up-to-date and your needs satisfied. Another popular and probably the very best insulation you can have in any home is spray foam. Spray foam comes in two styles, open cell and closed cell. Open cell is a softer foam usually used in walls during the construction of a home. Closed cell is a much harder product and completely seals the roof from the outside elements. When applied the foam rapidly expands filling all cracks and crevices in the roof while also providing structural integrity to your roof system. The end result is what we call a perfectly insulated home. The difference is night and day with a spray foam insulation application. If you opt-in for spray foam, there is no need for radiant barrier to be applied as the foam will resolve any heating issues. Closed cell foam also carries a high R-Value (6.0) per inch. The only downside to spray foam aside from being a bit messier to install is cost. It is substantially more expensive, but the results are unequaled anywhere in the industry. Please refer to our video on our dedicated spray foam insulation page. To learn more about the product lines we offer for insulating your Georgetown home, please click here to visit our main page. If you are ready to see what we can do for you, please feel free to fill out the quick form on the upper right-hand side of this page and we will get back to you shortly.